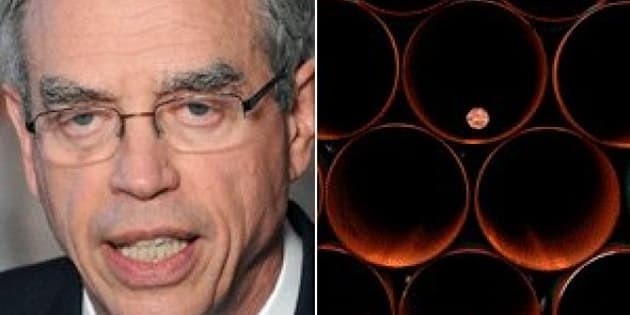 OTTAWA - The federal natural resources minister and the industry lobby group that represents oil and gas pipelines are "aligned on priorities, particularly on the need to expand markets," according to an internal government memo. The document, obtained under the Access to Information Act by the environmental group Greenpeace, comes to light as Natural Resources Minister Joe Oliver is in the United States burnishing the environmental record of the oilsands in an effort to bolster the controversial Keystone XL pipeline. Oliver met last July in Calgary with nine members of the Canadian Energy Pipeline Association, where they discussed the "importance of communicating to Canadians" the benefits of the energy sector and environmental measures. A ministerial event report after the July 5 meeting listed communications as the top two key issues discussed, followed by labour shortages in the pipeline sector and "support for the Government's 'Responsible Resource Development' initiative." Natural Resources Canada has an advertising budget of $9 million in 2012-13 and a new round of television ads, touting the "Responsible Resource Development" theme, are currently airing. The Conservatives announced in 2008 that the oil and gas sector would be regulated to reduce greenhouse gas emissions, with the rules in place at the start of 2010. Those regulations keep getting delayed, amid fresh promises they're coming soon. "Instead they've chosen to go with a pure communications strategy," said Greenpeace climate researcher Keith Stewart. "This is an industry that has an actual environmental performance problem. But both government and industry treat it as a public relations problem." The minister's meeting with the pipeline lobby group was summarized afterwards with the following "event outcome" description: "Participants aligned on priorities, particularly need to expand markets." Oliver spoke Wednesday at an oil refinery in Houston, where he said importing Canadian crude would help meet American demand "while virtually eliminating the U.S.'s reliance on other less stable and less environmentally responsible sources of supply." He also noted how Canadian oil production is creating jobs on both sides of the border. Reached for comment in Houston, the minister responded in an email that "I regularly meet with stakeholders to talk about promoting Canada as well as the need to abide by our tough standards and strive for even greater environmental performance." "Our government is proud of Canada, our natural resources, and our tough environmental standards," said Oliver. "When we talk about opening new markets we promote all three." It's all part of a broad communications strategy by the Conservatives that dates back to 2010, when government officials met with the Canadian Association of Petroleum Producers and agreed on "upping their game." "The approach would not just 'turn up the volume' on the existing approach — it would change tact (sic) and address perceptions by showing that the issues are being addressed and we have the right attitude," according to a March 2010 memo. Natural Resources Canada ran extensive focus groups last summer to fine tune an ad campaign designed to convince Canadians of the industrial benefits and environmental stewardship of the energy sector — particularly the oilsands. The Canadian Association of Petroleum Producers, meanwhile, is running its own campaign called "Responsible Canadian Energy" that plumbs the same themes. Governments at various levels and of various partisan stripes have frequently come to the aid of important industries that are under siege, whether it be fishing, sealing, forestry or the auto sector. What's different this time, say opposition and environmental critics, is the breadth and closeness of the government-industry ties. "When you can't see any daylight between the government and industry ad campaigns, I think it's a sign that the Harper government is confusing what's good for oil companies with what's good for Canada," said Greenpeace's Stewart. "And there really should be a distinction there." Green party Leader Elizabeth May, who once worked with the Mulroney Progressive Conservative government on environmental policy, said the problem now is that the ministers of Natural Resources and Environment, plus the prime minister, are all "championing industry — and nobody is watching out for the road kill." The government has failed to move on oil sands regulation despite knowing for years that Canada's energy sector has an international black eye, said NDP energy critic Peter Julian. "They're trying a public relations exercise and what they really need is meaningful action on climate change," said Julian. "I think as a result they're harming the chances of getting the approval for the (Keystone) pipeline." A fresh buy of "Responsible Resource Development" television ads has recently begun airing. But Natural Resources is flatly refusing to say when the latest round of taxpayer-funded advertising began or how long those TV ads will run — instead referring The Canadian Press to the government's annual advertising report, which is likely to be released sometime in 2014.